When my friend, Harry Lowe's stepmother, Josie, became a "woman of a certain age" (Southern women NEVER grow old) she decided that every day she would give something away. It was her way of clearing things out and passing on the various items she no longer needed. Harry Lowe has adopted this practice and I am often the willing recipient. When I go to D. C. and head into my room, there is a bedside table bedecked with articles to read, books, a returning canning jar or egg carton and very often, a surprise. Now I must tell you that during his working years, Harry Lowe, was a bit like Superman: Mild-mannered curator by day, but if he was needed, White-tie bedecked dinner guest and dancer by night. Now days, I'm afraid, the average invitation in Washington simply states: "Business Attire." The days of "White-Tie" are but a passing fancy, but Harry Lowe attended more than his fair share of party events. On one of my last visits, I received a collection of Handkerchief & Glove Boxes. Harry Lowe passed them on to me, as it is important, he reminded me, to keep ones hankies and gloves neat and easily accessible. Now days, he is much more at home as a Gentleman Farmer in Virginia where his work gloves and secateurs are neat and easily accessible. And while I no longer have a lot of gloves, as a confirmed Southerner, I always carry a hankie. Now I have a place to keep them. 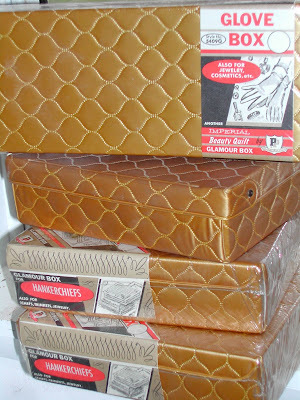 oh god, I love those retro plastic quilted boxes. Well I sort of do and I don't! My husband always has a clean, big handkerchief in his pocket and it's been invaluable to the rest of the family on occasions. little augury: As I once said, "I may not always wear under ware, but I ALWAYS carry a hankie." Rose C'est La Vie: I, too, like the daily give away idea. Toying with a blog to do just that.